People may talk about “pure” Americana but this is the real thing. 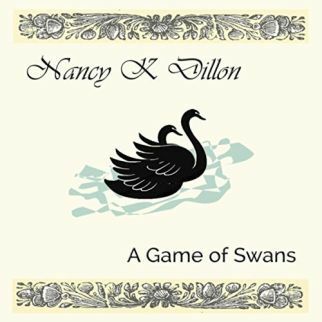 A Game Of Swans is Nancy K Dillon’s third studio album, recorded, by the wonders of electronic communications, on both sides of the Atlantic with a group of musicians reflecting her British roots as well as her Seattle home. The final song, ‘Poor Man’s Lullaby’, for example, is co-written by Gavin Sutherland (with a brief nod to Woody Guthrie) and part recorded in Aberdeen. It features the pseudonymous J J “Breeze” Bridges and Levon “Hawk” Marvell – ho, ho, ho. Nancy K Dillon has a warm, pure voice that you could listen to all night. There is that lilt that recalls a more Country Indigo Girls and some of Nancy Griffith's crystal purity. Dutchman's Gold shows her ability to weave stories out of touchstone lyrical elements to make textbook Americana. Nancy, strips back Drew Nelson's St Jude to its acoustic bones and invests it with a hymn like sense of light and hope. Annabelle has a great folk-blues pulse to its tune, gently played guitars from NKD and Chris Parks with a great foot stomp rhythm are hypnotic. With a touch of Townes Van Zandt's Waiting Round To Die, the tune and lyrics bring out the very best in Nancy's fine voice. It’s been close to 8 years since we’ve had new music from Seattle based singer-songwriter Nancy K. Dillon. Her fine album Game of Swans makes us hope it won’t be quite so long next time. Ms. Dillon’s voice remains flat out gorgeous – a dust-tinged Kate Wolf with the natural western lilt of Mary McCaslin. Come for the voice, but stay for the melodies and fictions that rise and fall like the stars over the lives of gold prospectors, tramps, and immigrants making their way through this sepia-toned American dream. Growing up in the dusty plains of Oklahoma just six blocks away from Route 66, this closeness to one of America's legendary transportation highways must have made an impression on a young Nancy due to the evident quality on these eleven songs. Like other respected artists that were raised close to places of travel, her longing to get up on her feet and see what's out there is evident on many songs as are other subjects of life. "Concise and intelligent songs delivered in a clear and lovely voice"
Opening with the strongest track on the album, ‘All The Pretty America’, Dillon releases her second album after a six year hiatus. Whilst the PR that accompanies this release enthuses madly about the album (as is their job), it doesn’t list the opener as a “recommended track”. Strange that, as it’s the one of the best here. There are many descriptions to cover the gamut that makes up Americana these days, but here’s a couple used to described Dillon’s work that may be new to you; avant-garde folk (WTF? ), okie-roots (WTF2?) and even mythopoeia (WTF3?.. it’s the process for creating myths apparently). Not only does Americana-UK inform but, we educate you. Bit like the BBC. Here are two CDs by singer-songwriters you probably haven't heard of. Of course, I could say that about two of a whole lot of singer-songwriters. The difference: chances are, you'll fall in love with both of them by your second listening, and probably sooner. As I have had occasion to express in this space before, I'm as cynical about singer-songwriters as they come. I also tend to assume the good ones are the ones I already know. Believe me, it is good to be surprised once in a while. "You’ll love the singing on ‘Glory Days,’ and in fact on the whole CD"
I could say you had me at the cover for this CD. ‘All the Pretty America’ is a wonderful showcase of Nancy’s voice and wonderful use of harmonies. The melody line of the key phrase, not to mention the phrase itself, is intriguing. ‘Last Town on the Line’ is train song with the best of them and a little kinder to Woody, “life was hard for a trainman…” The vocals are powerful and the lyrics are well crafted. The rhythm and the instrumentals are as good as it gets: fiddle, slide guitar, mandolin. ‘No Goodbyes’ is another gem for lyrics and a fine chorus. It’s not hard to resonate with the sentiment of ‘Good Old Friends,’ or with the steady beat behind the lyrics of ‘Portland.’ You’ll love the singing on ‘Glory Days,’ and in fact on the whole CD. Catch Nancy whenever she passes through. "Just let me dream ..... " No doubt "Sweet Honey" Nancy K. Dillon in 2004 dreamed of a very successful career and, to be honest, with "Just Let Me Dream" and valued contributions to the albums of other artists including Michael Hill, John Nelson, Gavin Sutherland, Ian Lang and MJ Bishop, there were legitimate reasons. Moreover, the lady from Seattle at that time captured my heart with her version of Jimmy Lafave's "Give Your Sweet Love To Me" – a fine cover. So we had to wait until now before the successor 'Roses Guide to Time Travel” saw the light…but…patience is a virtue and clean as the music brings a kind of pleasure which human nature can not do without. There's no explanation in the press release as to why there's been six years between the Oklaholma singer-songwriter's debut and her apostrophe-challenged sophomore album, so just be grateful that it's finally here. Featuring contributions from such musicians as Danny Barnes, Gavin Sutherland and Stacy Phillips, as before, it's a desert dust coated brew of bluegrass, folk, honky tonk, blues and country in service of songs about small towns, trains, highways, drifters, loving and losing, leaving and hanging in as, per the title, years pass by. "stories of intriguing appeal on a substantial and inspired album"
"Just Let Me Dream" was the title of the debut album which Seattle resident and singer-songwriter Nancy K. Dillon released to the world in 2004. She reaped a lot of positive criticism in the professional press but the large commercial success then nevertheless stayed away. Six years it has been before a follow-up for that first album comes on the market. Now eleven tracks appear on Roses Guide To Time Travel with songs all composed by Nancy herself. Nancy K. Dillon grew up in a very musical family and has had the opportunity to share the stage in the past years with several artists such as Jimmy LaFave, Kevin Welch, Guy Clark and The Everly Brothers. They could make a broader public warm for her own country music and bluegrass inspired folksongs and this second cd can also count on more approval than her debut album. "If I could sing like that, I wouldn’t bother much with instruments."